The results reinforce the importance of identifying vitamin D insufficiency among the elderly. Here, low vitamin D levels were associated with significantly faster rates of decline in memory and executive function performance. This study included approximately 400 men and women participating in research at the Alzheimer's Disease Center in Sacramento, Calif. The participants had a mean age of 76 and were either cognitively normal, had mild cognitive impairment, or had dementia. At the start of the study, the participants' serum vitamin D levels were measured and the results showed that vitamin D deficiency and insufficiency were prevalent among all participants. Twenty-six percent were found to be deficient while thirty-five percent were insufficient. At the 5 year follow-up, vitamin D deficient participants experienced cognitive decline at rates 2-3 times faster than those with sufficient vitamin D levels. The researchers expected to see cognitive decline in individuals with low vitamin D status; however, they did not expect how profoundly vitamin D impacts cognition. 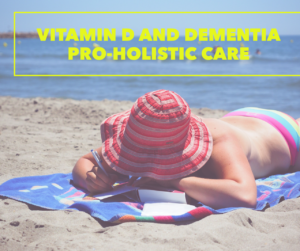 There is enough evidence to recommend that health care providers should discuss daily vitamin D supplementation with their elderly patients. Vitamin D deficiency is a common problem that is associated with many health consequences, yet this deficiency could easily be addressed. Sun exposure is the ideal source of vitamin D, but for most of us, sunlight itself is not enough; our bodies require us to obtain vitamin D from other sources. Some racial and ethnic groups are at greater risk of low vitamin D because the higher concentration of melanin that makes their skin darker also inhibits vitamin D synthesis. Many people avoid the sun or cover up with protective clothing due to the dangers of overexposure. In addition, most of us spend a great deal of time inside under fluorescent lights and away from natural light. Also, depending on the particular time of year and what latitude you live at, you may not be able to get adequate vitamin D from the sun. In some locations this can be most of the year. Our advanced nutritional laboratory work not only review Vitamin D, but also all your nutritional needs, disease process and health trends. Contact us for more detail. The information on this website is not intended to replace a one-on-one relationship with a qualified healthcare professional and is not intended as medical advice. It is intended as a sharing of knowledge and information from the research and experience of Pro-Holistic Care Doctors. Dr. Vargas and Dr. Rae encourages you to make your own health care decisions based upon your research and in partnership with a qualified healthcare professional.